Sayani attended the screening of her movie wearing Zara. Wearing her hair back, the actor finished out her look with a dark lip, Furla chain-strap bag, Curio Cottage jewelry and black pumps. She looked good; we like! Sayani attended the Delhi premiere of ‘Margarita, With A Straw’ wearing a cutout dress by Arunima Majhi, who you’ll remember made her debut as a Gen Next designer at LFW last year. The dress may not be everyone’s cup of tea but Ms. Gupta sure makes it work. I quite like it on her. The bag pick, though, not so much. 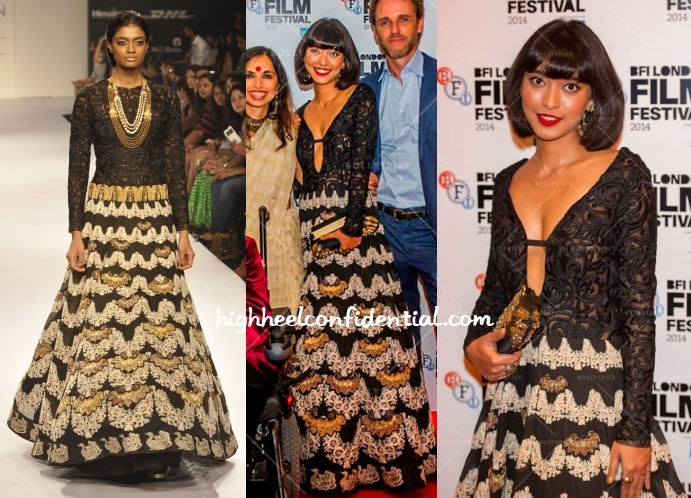 Sayani, who also stars in Margarita With A Straw, attended the movie’s screening at BFI Film Festival wearing an ornate Jade creation. Presented on the runway with a high-neckline, Sayani’s version featuring a plunging one held together by a tiny strap. If you ignored the neckline, she looked nice. Unfortunately, we really couldn’t.